THE ANTERIOR CRUCIATE LIGAMENT RUPTURE | GEORGE D. GOUDELIS MD. Ph.D.
Anatomy is the basis of orthopaedic Surgery. For the purpose of anatomic Anterior Cruciate Ligament Reconstruction (ACL), it is essential to understand the anatomy of the native ACL. The ACL consists of two functional bundles, the anteromedial (AM) and the posterolateral (PL) bundles. They are named after the position of their insertion sites on the tibia. 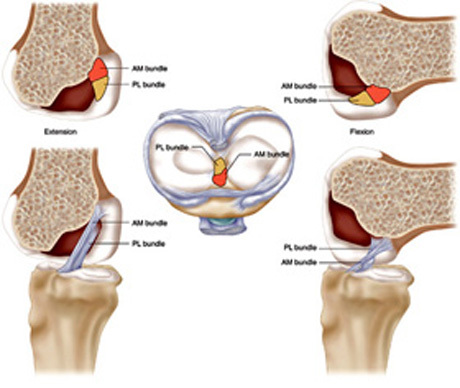 The AM and PL bundle function at different knee flexion angles. The anteromedial bundle is taut throughout the range of motion of the knee, reaching the maximum tension between 45° and 60°, whereas the posterolateral bundle is tight primarily in extension. This configuration allows them to work together to provide anteroposterior and rotational stability of the knee. Knee kinematics. The role of cruciate ligaments. 1. Clipping injury. The most common injury to the ACL is associated with valgus load and external rotation of the tibia on the femur. 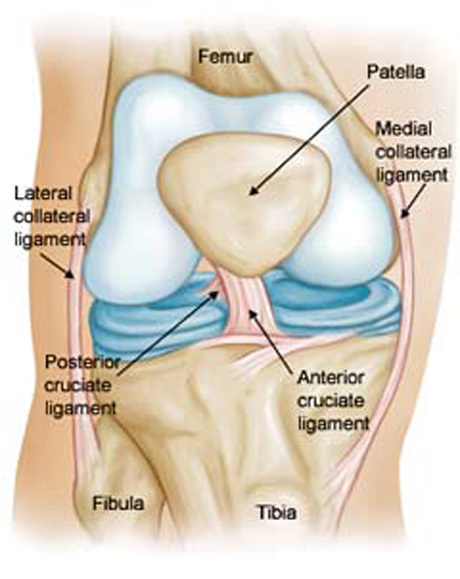 The mechanism of injury is often associated with damage to the medial collateral ligament and medial meniscus. Most patients claim that the knee ‘gave way’, ‘buckled’, or ‘popped out’ at the time of injury. Swelling is usually immediate in onset and maximizes within the first 2-3 hours after injury. Most patients have immediate and profound disability with guarded or painful range of motion and the inability to ambulate. Clinical examination, knee instability (ROLIMETER) . The examination should start with evaluation the normal knee for a ‘built-in’ comparison. The painful knee should inspected for areas of ecchymosis, swelling, effusion, or tenderness. Range of motion should be evaluated. Flexion and extension frequently compromised because the large amount of effusion following injury. Ligament stability special testing is performed. Magnetic resonance imaging (MRI) is necessary for complete checking of the knee joint. Clinical examination is the most important part. Ligament injuries in children were once believed to be rare, or even not to occur at all. This belief has been disproven. Over the last two decades additional reports have documented, by the use of more accurate physical and diagnostic examinations, the increasing incidence of ligamentous injuries in the skeletally immature knee. Several factors have led to an increased interest in injuries to the knees of children. First, there has been a documented increase in the number of children participating in organized sports. Some of these activities are known to put the knee at a higher risk for ACL injuries. Second, there is a height-ened awareness within the medical community for the possibility of various ligamentous injuries patterns. Finally, the the improved diagnostic technologies now available to the orthopaedic surgeon have provided the means for a more accurate and precise diagnosis of ligamentous injury in the skeletally immature knee. A primary concern with all pediatric knee injuries is the physis. Figure shows lateral views of the normal physis. Growth plates, (red arrows), are the bone growth points. Special techniques are used during the operative process to avoid the development of bone problems in adolescents. 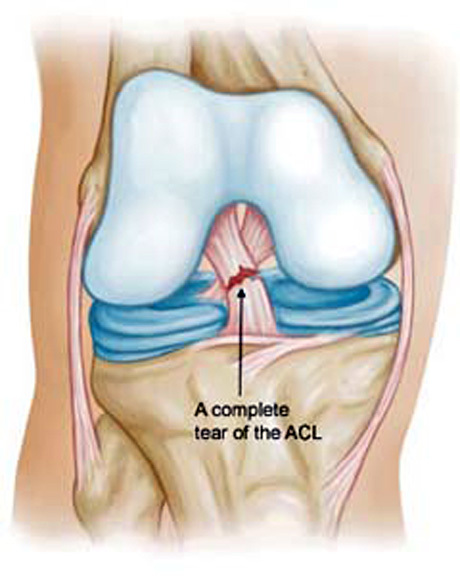 Nonsurgical treatment generally is not recommended today for ACL rupture. The risk of meniscal injury is very high in unstable knee. Older, less active patients do well without reconstruction, especially if they participate in a rehabilitation program and modify their chosen activities. Ice immediately after trauma decrease the swelling and pain. Anti-inflammatory drugs for the inflammation and pain for the 3 days post trauma is beneficial. Brace. The efficacy of knee bracing in the ACL-deficient knee is not clear. Approximately two thirds of patients feel more stable. Functional braces help to limit anterior translation of the tibia at low loads. Exercises. Regaining range of motion, muscle strength and proprioception is the most important aim of the training program. With steady advances in arthroscopically assisted ACL reconstruction techniques and rehabilitation protocols , outcomes of ACL reconstruction have improved substantially since the 1980s. Current minimally invasive techniques of reconstruction emphasized the anatomic placement of high strength ligament grafts using rigid fixation techniques. The treatment for a patient with an acutely torn anterior cruciate ligament (ACL) is individualized by factors such as age, occupation, level of sports participation, and associated intra-articular and ligament injuries. An important consideration in the discussion with the patient is the patient's willingness to modify high-risk activities in the future. We usually recommend anterior ligament reconstruction in the more physically active individuals of all ages who want to pursue activities that involve lateral movement, sudden stopping, and change of direction. We also suggest reconstruction of the ruptured ACL when there are significant associated meniscus tear(s) and/or a concomitant ligament injury. The decision to perform reconstructive surgery in someone with symptomatic knee instability due to chronic ACL deficiency is less controversial. Patients with an anterior cruciate deficient knee have had a chance to experience the limitations it imposes on their lifestyle. Usually the reason they have made the appointment with the surgeon is because they no longer want to live with the limitations if something can be done to correct the knee. For the purpose of anatomic ACL reconstruction, it is essential to understand the anatomy of the native ACL. The ACL consists of two functional bundles, the anteromedial (AM) and the posterolateral (PL) bundles. They are named after the position of their insertion sites on the tibia. This configuration allows them to work together to provide anteroposterior and rotational stability of the knee. Graft measurments which determine the diameter of bone tunnel in tibia and femur. The graft from hamstrings tendons is ready to transplant for double bundle ACL reconstruction. The graft from patella - quadriceps tendon is ready to transplant. 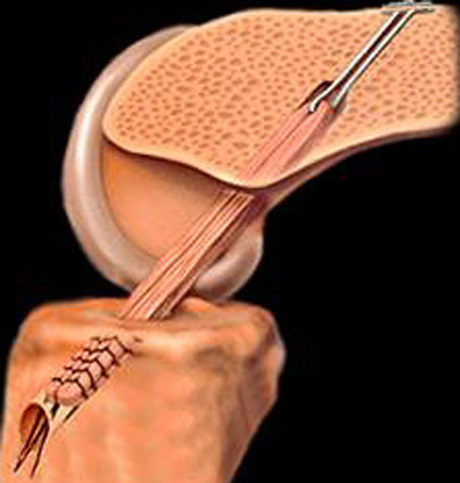 Graft passing through the femoral and tibial tunnels. Fixation. Anatomic positioning of the graft. Based on the advanced knowledge of the double bundle anterior cruciate ligament anatomy, anatomic double bundle technique for reconstruction of the ACL is gaining popularity. ▪ The indications for anatomic double-bundle ACL reconstruction are similar to those for traditional single-bundle reconstruction. ▪ Patients with recurrent instability or episodes of giving way or those who are unable to return to activities of daily living or sports are appropriate for surgical reconstruction. ▪ Patients with complaints of instability and a single-bundle or “partial” tear may benefit from single-bundle augmentation, or double-bundle reconstruction in the event the remaining bundle is incompetent. Anatomic double bundle reconstruction of the anterior cruciate ligament. In rare instances, partial ligamentous disruption of one anterior cruciate ligament bundle may occur. This can occur for rupture of the native ACL, as well as after previous double-bundle ACL reconstruction. There is multiple benefits of augmentation surgery over removal of the whole ACL and performing a complete primary reconstruction. Leaving the intact bundle preserves the proprioceptive qualities of the native ACL. Single – bundle augmentation is less invasive due to the need for fewer bone tunnels and hardware. 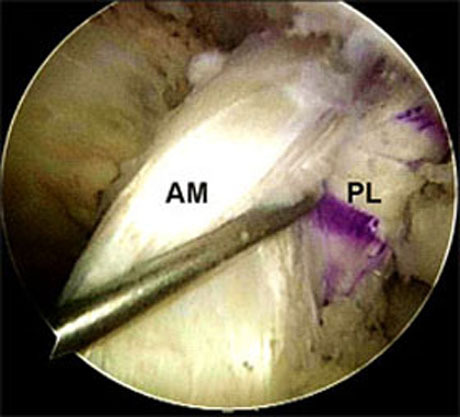 Arthroscopic view of double bundle ACL ligament. b. AM bundle rupture. PL bundle is intact. c. PL bundle rupture. AM bunle is intact. Intrasubstance anterior cruciate ligament (ACL) injuries in children and adolescents are being seen with increased frequency and have received increased attention. ACL injury has been reported in 10% to 65% of pediatric knees with acute traumatic hemarthroses in series ranging from 35 to 138 patients. Management of these injuries is controversial. 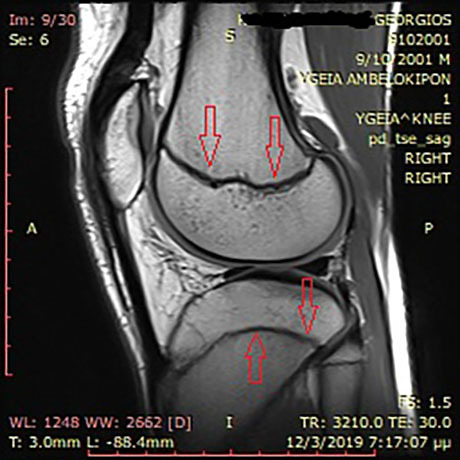 Nonoperative management of complete tears in skeletally immature patients generally has a poor prognosis, with recurrent instability leading to further meniscal and chondral injury, which has implications in terms of development of degenerative joint disease. A variety of reconstructive techniques have been utilized, including physeal-sparing, partial transphyseal, and transphyseal methods using various grafts. All skeletally immature patients are not the same. Some have a tremendous amount of growth remaining, while others are essentially done growing. The vast majority of ACL injuries in skeletally immature patients occurs in adolescents. Management of these injuries in preadolescent children is particularly vexing, given the poor prognosis with nonoperative management, the substantial growth remaining, and the consequences of potential growth disturbance. In the prepubescent patient with a complete ACL tear without concurrent chondral or repairable meniscal injury, nonreconstructive treatment with a program of rehabilitation, functional bracing, and return to non-high-risk activities is attempted first. Although the results of nonreconstructive treatment are generally poor, with subsequent functional instability and risk of injury to meniscal and articular cartilage, surgical reconstruction poses the additional risk of growth disturbance. Furthermore, some patients are able to cope with their ACL insufficiency or modify their activities, allowing for further growth and aging such that an adolescent-type reconstruction can later be performed with transphyseal hamstring tendons in a more anatomic manner. 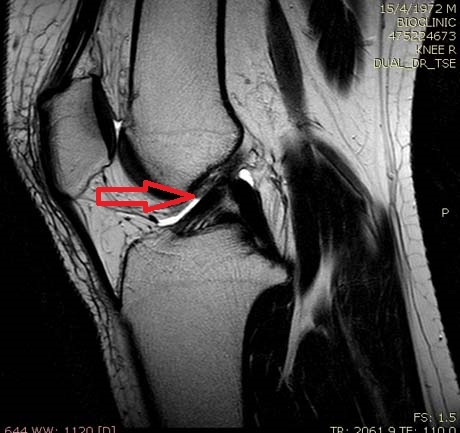 For adolescent patients with growth remaining who have a complete ACL tear, initial nonreconstructive treatment is not advised, because the risk of functional instability with injury to the meniscal and articular cartilage is high the risk and consequences of growth disturbance from ACL reconstruction are less. 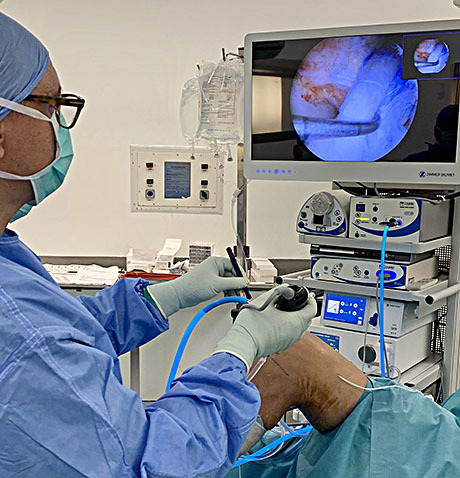 For older adolescent patients who are approaching skeletal maturity and who have a complete ACL tear, conventional adult ACL reconstruction is performed with interference screw fixation, using either autogenous central third patellar tendon or autogenous hamstrings. Anterior Cruciate ligament reconstruction with autograft in girl 13years old. The rehabilitation should begin the first post op day. Early extension is achieved with a pillow under the ankle joint passively. A small plastic bottle of water under the knee joint (supine position) and interval training of quadriceps muscle keep the strength until official physical therapy program starts. Ice or another form of cryotherapy should be utilized to treat the normal postoperative effusion. Unless a meniscal repair was performed, full weight bearing as tolerated is allowed. Return to sport is typically between 4 and 6 months postsurgery. The use of a brace after ACL reconstruction is not necessary except if combine with meniscal repair.